Like peas, broad beans (also known as fava beans) are legumes; good sources of protein, carbohydrates and vitamins (A, B1 and B2). They are hardy and adaptable and can grow in most climates and soils, so are great for your children’s vegetable patch, or in a pot on your window sill. By mid summer broad beans are often found either in flower or just starting to pod in farmers fields. 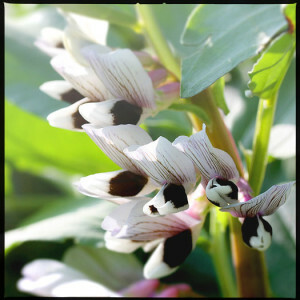 You can either wait for the beans, or collect a few flowers which are perfectly edible and look great on salads. Older beans – pod then boil or fry only the beans for a few minutes, squeeze from their skins so you are only left with the tender green bean. To boil: Cook for about 3 minutes in salted boiling water, then rinse or plunge into cold water to stop the cooking process. To fry: use a little oil with some crushed garlic, and fry for 3 minutes. Boil the broad beans for 3 minutes until they float, drain and rinse under cold water. Remove any skins. Start the pasta cooking in salted boiling water for about 12 minutes, or until cooked. In the meantime heat a pan with a tablespoon of oil and fry the garlic and anchovies until golden. Pour in the beans and stir for about a minute until they are all coated with the oil. Take the beans off the heat and use a potato masher to crush the beans to a rough paste and stir in the Parmesan, lemon juice and zest, and oil. Take the pasta off the boil, rinse and pour in a little oil. Mix the pasta and the pesto and serve immediately. Garnish with your broad bean flowers.